Good deep red color and a very vibrant nose of sweet cherry, strawberry, wet stone, and a tinge of coco. The flavor a very similar to Santa Barbera type Pinot's. Very vibrant and alive, and lots richer than what I was expecting. Lots of mouth feel and a pretty long finish. Flavors of ripe, dark cherry, home grown strawberries, crisp red table grapes. I really like this wine and think it out drinks the Sonoma Pinot from the same producer. I score the wine 90 points. A great crowd pleaser indeed! 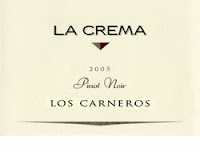 I couldn't agree more..this wine was startling, especially after we have enjoyed Sonoma Coast Pinot from La Crema for years. Only wish it were more affordable. I have been looking everywhere to find more of these bottles....scoured all the best wine shops within 30 miles and still have had no luck. Does anyone know of a REPUTABLE online broker/store that would have it? Any help would be greatly appreciated as I enjoy the 2006 but it's not in the same ballpark as this amazing 2005.